The use of Ethernet in industrial applications brings with it huge benefits in terms of enabling quicker, flexible and more reliable communications within industrial plants. At the same time, it requires new skills for control engineers in understanding the principles of Ethernet Network design. Before designing a network it’s worth getting familiar with some basic Ethernet principles. These include: Types of Ethernet traffic, infrastructure devices, Ethernet cables, and network topologies. Devices on a network can send data to other devices using several different message types depending on the number of devices that need to receive the information. Message types seen on an Ethernet Network include unicast (communication between two devices), multicast (communications from one device to a set number of devices) and broadcast messages (communication from one device to all devices). The total amount of traffic on a network depends on the type of message traffic. Unicast, for instance, adds traffic only to its network segment while broadcast adds traffic to all network segments. Nodes on an Ethernet network are interconnected using different types of infrastructure devices. Generally, it’s best to use managed switches instead of hubs in an Industrial Ethernet Network since they allow for redundant configurations, management of network traffic, diagnostics, and monitoring. Additionally it is recommended to use full duplex connections to eliminate collisions, which can result in lost data. Using full duplex also provides greater bandwidth (100 Mb in both directions) and allows devices to send requests even when receiving additional requests or other traffic. Management of network traffic is accomplished using features such as Quality of Service (QOS), VLANS, and filtering. 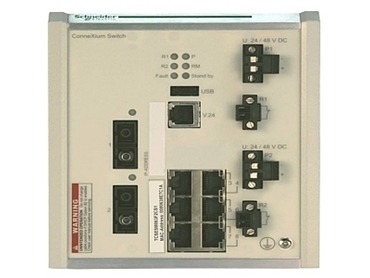 Managed switches incorporate SNMP (Simple Network Management Protocol) to interface with network management software to provide diagnostic parameters such as link status, link bandwidth etc. Redundant configurations require the switch to support a redundancy protocol such as Rapid Spanning Tree Protocol (RSTP), Media Redundancy Protocol (MRP) or HIPER-ring. Each redundancy protocol offers different performance characteristics; therefore you must choose the protocol with recovery times that meets your application needs. The two types of cables used in an Ethernet network are Copper (TX) or Fibre (FX). Fibre cable is a better choice for longer distances, especially when there is no common earth between the two ends. It provides complete electrical noise immunity. The two most common types of fibre cable used are single mode and multimode. Single mode fibre can be used for distance up to 30 km depending on wavelength and system attenuation. Multimode fibre is limited to 1 - 5 km depending on wavelength and system attenuation. Network layout is no longer restricted by old rules created for early coax networks. 100 Mb network speeds, coupled with the typically low traffic level of an industrial network, means that in most cases layouts can be designed without accounting for network load. Additionally the current technology and infrastructure devices available today allow for different network topologies such as bus, star, ring, and mesh networks. Each topology has its advantage and disadvantages and can be combined to suit application needs. A control engineer does not have to be an IT or Ethernet expert to design an industrial automation Ethernet network. All that is needed is a basic understanding of the Ethernet principles; types of Ethernet traffic, infrastructure devices, Ethernet cables/connectors, and network topologies.